France on Fridays continues with a trip to the market in the Aveyron. This has been a strange week. I haven’t been able to post since the last France on Fridays post due to serious gremlins. I won’t bore you with details but hopefully they’ve all been sorted out for the time being. You may also spot that Maison Cupcake is now on a top level domain MaisonCupcake.com instead of having a clumsy “blog dot” in front. Your RSS feeds, hopefully will not be affected. So today I bring you the second France on Fridays picture. I couldn’t remember where it was but with the help of Google managed to identify it. In 2006, we flew to Rodez with Ryanair (officially the second smallest airport I’ve ever visited – the smallest, with a portakabin as a departure lounge was Coventry). Rodez is not somewhere many people had heard of but it’s a 90 minute drive inland around half way between Toulouse and Montpellier. We never went into Rodez itself I so can’t comment what the place itself is like however it’s a good location to drop off to the lesser known Lot region. Although we were staying in Figeac in the Lot, we drove around 20 miles south into the Ayeron region to the market at Villefranche-de-Rouergue. The market at Villefrance was notable for taking place in this small enclosed square. There were Italian loggia style walkways around the edge and you could get a great view from some raised steps in opposite corners. Before we had Ted, we always visited markets but were staying in hotels and had no need to cook. Our purchases were usually fougasse, bread and cakes or occasionally some fruit for picnics. Nowadays we tend to travel self catering and do most of the shopping in a Super U or Intermarche for convenience with the car. I try to make sure we have at least one day when I can do some proper French market shopping. Big fat tomatoes and white peaches are my favourite things to buy. With a fresh baguette and some goats’ cheese it’s all you need for lunch. Which are your favourite markets in France? There is a small but full market in Amboise that I remember fondly. I don’t know Amboise. Is it to the West? I love the French markets so much. The stall holders take such pride in them and only sell top quality goods offering such a brilliant selection of local regional produce. Over the last few years we have been in the Dordogne and would have to recommend both Perigueux and Riberac markets. Such a fine collection of al things food! We went for a daytrip to Sarlat the same week as this holiday here but that’s the closest I’ve been to the Dordogne so far. I also love French markets. 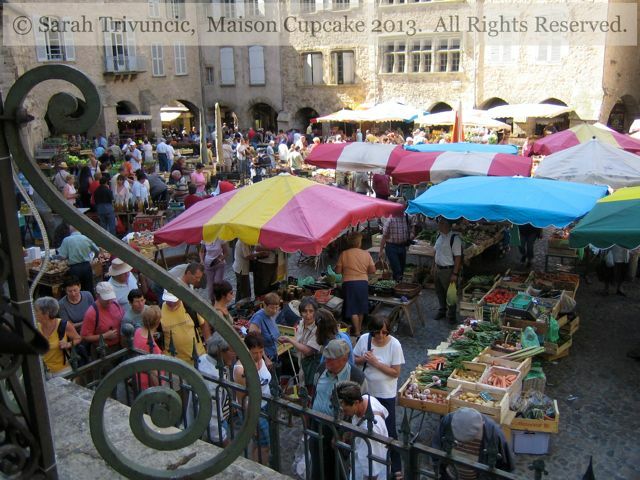 Last summer we went to Vaison la Romaine, it was streets of market stalls. Although I must say I like the smaller markets you stumble upon even more. I remember Vaison la Romaine – I think we drove up Mont Ventoux straight afterwards! Carpentras and the daily markets around the village of Monmorion. Visit every morning for our lunch/dinner needs. I know Provence so well but Carpentras is still on my list to visit. Do you live there or just go for holidays? I do love French markets… My only association with Aveyron is canoeing down the Aveyron gorge last summer for a day – was spectacularly good fun!